Don’t be fooled by all this blabber about Windows 8.1 being Microsoft’s grand chance for a re-do—talk I’m admittedly guilty of myself. Windows 8.1 does a terrific job of refining Microsoft’s modern-style vision, but as an operating system built from the ground up to revolve around an app-based experience, it—and specifically the Start screen—can never truly shine unless the Windows Store is stuffed. That’s a big problem, since both the quantity and the quality of the Windows Store’s selection has been lackluster thus far. Microsoft seems to be tackling the issue head-on, though: Not only did the number of apps in the Windows Store spike in the weeks ahead of Build 2013, but Microsoft took advantage of the developer conference to announce a slew of high-profile apps coming to Windows 8’s virtual marketplace. Here’s a rundown of the biggest apps destined to land on the Windows Store’s currently dusty shelves. Yes! A Facebook app is coming to the Windows Store. Finally—finally—a proper Facebook app is coming to Windows 8, where we hope it will embrace the modern style as wholeheartedly as the Windows 8 Twitter app. While no official launch date was announced, you can look forward to a day where “Pin an IE shortcut to the Start screen” isn’t Microsoft’s official answer to the missing Facebook-app question. Yes, the popular social check-in service is coming to Windows 8 at some unspecified point in the future, Microsoft announced yesterday. Live Tile fanatics will no longer have to rely on third-party alternative apps to become the mayor of their favorite taco carts! The few screenshots Microsoft showd really seem to nail the modern motif. 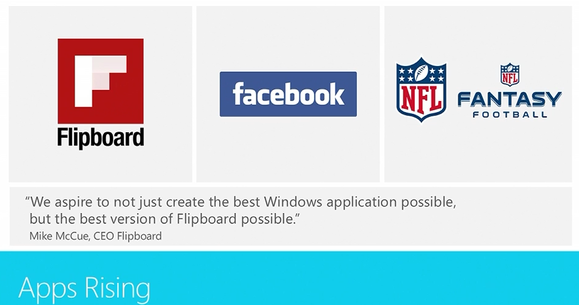 Flipboard was one of three apps Steve Ballmer specifically mentioned at Wednesday’s Build 2013 keynote. Don’t worry, we’ll get to apps that don’t start with F soon. 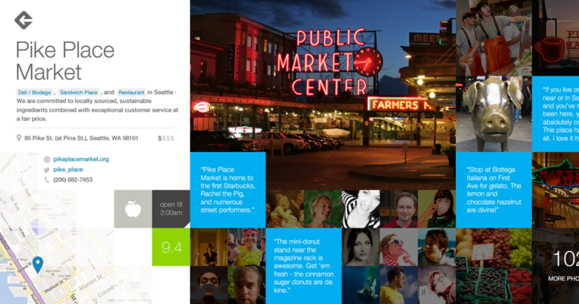 Flipboard is a newsreader app with an image-heavy style that should translate well to Windows 8. It’s similar to the Microsoft-exclusive New Bento. Flipboard pulls in not just news, but also posts from your various social feeds, making it close to a one-stop, up-to-the-minute news shop. It’s incredibly popular on iOS and Android, so look for the app to make waves in the Windows Store whenever it launches, too. Streaming music services haven’t exactly stampeded to Microsoft’s camp. Aside from Slacker Radio, Nokia Music, a couple of apps that play digital streams of terrestrial radio, and Microsoft’s own baked-in Music app, all has been quiet on the Windows front. 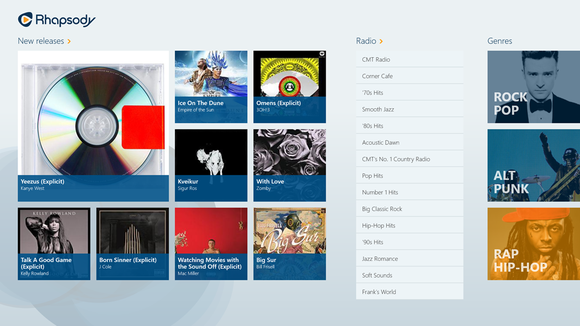 Microsoft’s storefront still doesn’t have dedicated Pandora, Spotify, MOG, or Rdio apps—but now, it does rock one of the most storied names in streaming music: Rhapsody. Available now, the Rhapsody app is free, though you’ll need a premium Rhapsody subscription to use it. Don’t have one of those? You can sign up for a free trial right from the app’s starting screen. 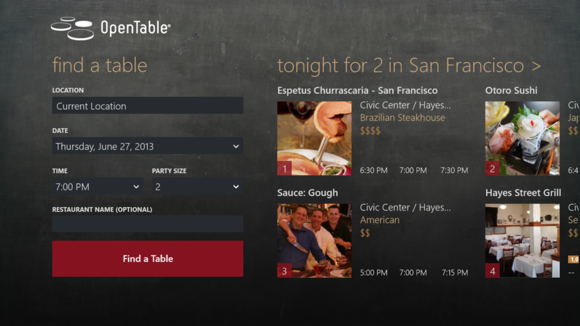 OpenTable lets you make real-time reservations at tens of thousands of restaurants across the country, making it handy-dandy for Windows-tablet-wielding foodies. Seriously, if a restaurant has any sort of Web presence whatsoever, you can probably find it on OpenTable—and you can find the OpenTable app in the Windows Store right now. Rockmelt is kind of like Flipboard, but with a few extra wrinkles. In addition to displaying the sites, YouTube feeds, and social feeds you follow (in modern-tinged visual fashion, natch) on the opening screens, Rockmelt lets you check out the latest news in more than a dozen preset categories, like Cars, Business, Travel, and Tech & Geek. It’s a pretty nifty app, and it, too, is available in the Windows Store right now. Now we know what all those NFL coaches are doing with all those Surface tablets: Playing fantasy football! 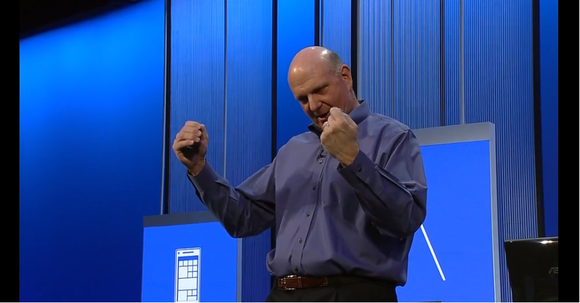 At the Build keynote on Wednesday, Steve Ballmer announced that NFL apps are Windows 8-bound, starting with a Fantasy Football app. The exact release date is yet to be announced, but here’s hoping we’ll see it before opening day (September 5, in case you were curious). The somewhat creepily named Where’s My Mickey? is already available in the Windows Store, but that’s just the tip of the torrent. Microsoft announced that Avengers: Initiative, Monsters University, Temple Run: Oz, Toy Story Smash It!, and Wreck-It Ralph apps are all inbound this fall. That’s a flood of fairly big-name apps. 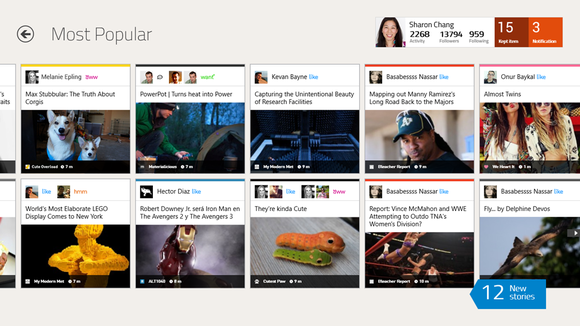 In the weeks and months ahead of Build 2013, we saw additional high-profile Windows Store releases like MLB.tv, Nokia Music, Twitter, Vevo, and a Discovery Channel app. Build also brought a momentous under-the-hood announcement when the uber-popular Unity game engine announced support for Windows 8, along with Windows Phone 8 and Xbox One. And of course, Windows 8.1 packs a few new native apps of its own, like Reading List and Health & Fitness. Yes, there are still some prominent Windows Store no-shows, but the recent announcements show that Microsoft’s wooing of developers is finally starting to pay off. The Windows Store still has a long road to travel before it becomes a compelling destination, but at least it finally appears to be on the right track. The next question: Can Microsoft keep up the momentum, or did it exhaust all its star power in a big Build blow-out? Keep an eye on the Windows Store in the coming months.